Chocolate Works is a manufacturer of high-quality Belgian chocolates specializing in decadent, customized chocolate experiences. Chocolate Works needed to polish up and increase their online presence and required a sophisticated, highly customized eCommerce solution with a well crafted, user experience. We chose Roboto Slab because it very closely matched the font within the Chocolate Works logo. Our goal was to select a quirky and whimsical headline font with a style of serif that reflected the “fun” that the Chocolate Works brand celebrates. Open Sans was selected as a body font for clear legibility, and its cleanliness compliments the bold quirkiness of the headline style. We coordinated a photoshoot to best represent their capabilities for customizing delectable Belgian chocolates to fit any special occasion. We chose product-inspired, playful patterns with holiday motifs and intriguing textures that could carry over to the website, packaging and other marketing materials. Chocolate Works approached us with a unique eCommerce goal to fulfill various streams of revenue through a unified online platform. With an aim to target national franchisees to join their franchise, we were to create a robust eCommerce website with a fantastic end-user experience for the online shopper. With engagement like never before, we have seen an increase in online revenue, online bookings for birthday parties and workshops, and corporate gifting and promotional product orders. Built on Magento 2.0, the new Chocolate Works eCommerce website consists of several custom features such as party and event booking, a franchisee dashboard, a store locator, and configurable products. 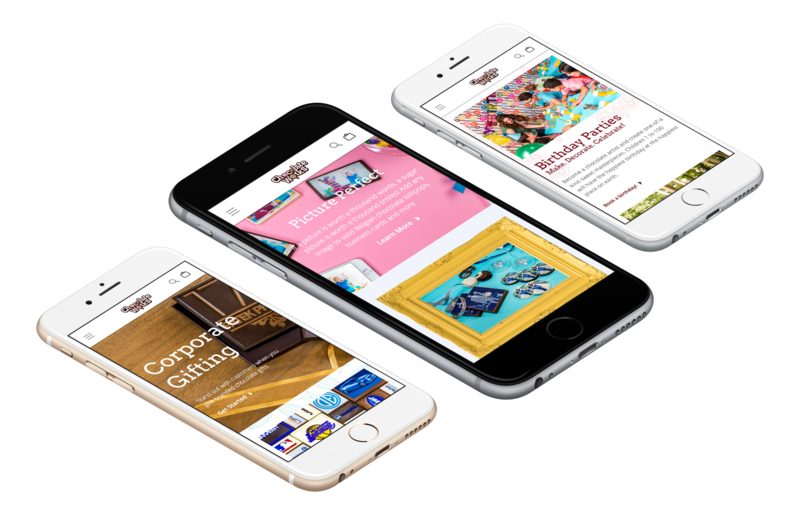 We integrated party planning software, social media feeds, a clean navigation, and custom functionality to elevate the user experience. 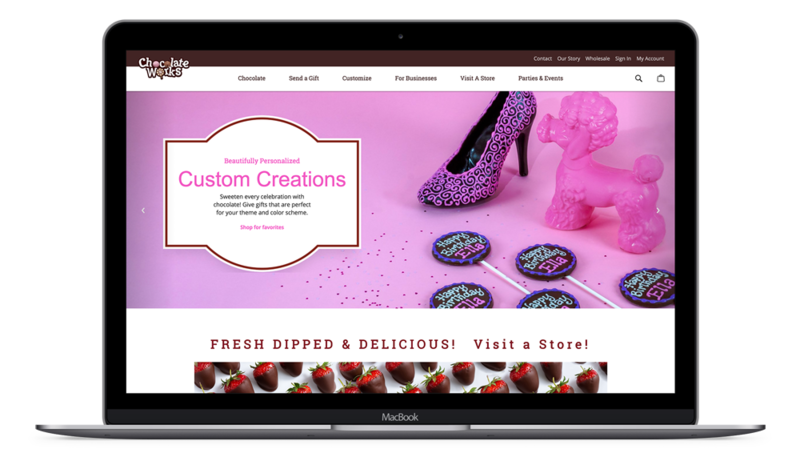 Chocolate Works’ website was fully customized and built to meet and exceed the company's e-commerce goals, nationwide. Online shoppers can successfully browse the website, gain full information about each product’s details and experience seamless transactions no matter the order size. Moving full speed ahead, Chocolate Works continues to see tremendous growth from all streams of online revenue.